Members of the Rocketdyne Cleanup Coalition, who have worked for two decades to achieve today’s historic development, expressed great joy over the signing of the breakthrough agreements with the Department of Energy and NASA for the cleanup of contamination at the Santa Susana Field Lab. The Coalition has fought since 1989 to get the site cleaned up. Assemblywoman Julia Brownley, State Senator Fran Pavley, Ventura County Supervisor Linda Parks, LA County Supervisor Zev Yaroslavsky, and LA City Councilman Greig Smith have expressed their support for the final Agreements on Consent reached between the California Department of Toxic Substances Control and the Department of Energy. The Federal-State Agreements in Principle are an historic breakthrough in the community’s efforts to clean up Rocketdyne. The Agreements’ key provisions include: cleanup to local background, EPA perform the radiation surveys, cleanup standard not to be exceeded, wastes to be disposed of in licensed disposal sites, measures to expedite the cleanup, and more. 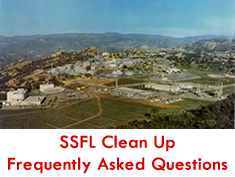 Support for the SSFL cleanup agreements was overwhelming—1700+ comments in favor, compared to a handful of comments that raised some questions. Even those few questions, however, were largely due to misconceptions about the agreements, or about matters that were addressed in more detail in the subsequent draft Agreement on Consent. These questions are briefly discussed in this post. 1700 Comments Received in Favor of SSFL Cleanup Agreement! The Rocketdyne Cleanup Coalition has been active for over twenty years. Browse through our photo gallery to see the people who've joined us along the way, as well as photos of the SSFL site from past to present. They say seeing is believing. Well, check out our video gallery to see videos that document the partial meltdown that occurred at the Santa Susana Field Laboratory and health risks associated with the site. The Rocketdyne Cleanup Coalition, or RCC, is a community-based alliance of organizations and individuals dedicated to the cleanup of the Santa Susana Field Laboratory, commonly known as Rocketdyne. Copyright Rocketydne Cleanup Coalition 2010. This site is best viewed with Firefox, Chrome, Safari or IE 8. Ensure that Java and Flash are enabled and up to date.